Nadine is a Research Fellow in the Centre for Health Services Research. She is a chartered psychologist with special interests in the self-management of chronic conditions, health related behaviour change, and intervention development. Nadine joined Professor Newman’s research group at City University London in 2012. Nadine obtained her BSc (Hons) Psychology with Neuropsychology and later her MSc in Clinical Psychology at University of Wales, Bangor. She then went on to complete her PhD in Health Psychology at Dublin City University. Nadine’s doctoral thesis used a mixed methods approach to examine the development, effectiveness, and acceptability of integrated exercise and psychotherapeutic interventions for facilitating help-seeking and improving the mental health of young adult men. In her position as Research Fellow at City University London Nadine continues to investigate the effectiveness of behaviour change interventions. 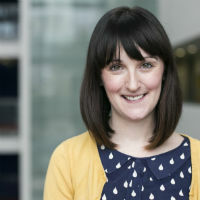 She currently works in the areas of self-management of long-term conditions, impact of genetic risk information on health behaviour change, and assessing quality of recovery from surgery and anaesthesia. Nadine’s main research interest is in the design, development, and evaluation of complex interventions for improving physical and mental health. Specifically, Nadine is interested in interventions which aims to (i) enable patients with chronic conditions such as diabetes to manage their health, and (ii) facilitate help-seeking behaviour for psychological distress. Project: Fidfelity of intervention delivery in the cordia diabetes self-management intervention. McGale, N., Davies, A., & Lorencatto, F.
Project: Highfidelity interventions to improve health: a systematic review. Francis, J.J., Davies, A., & McGale, N.
Rixon, L., Baron, J., McGale, N., Lorencatto, F., Francis, J. and Davies, A. (2016). Methods used to address fidelity of receipt in health intervention research: a citation analysis and systematic review. BMC health services research, 16(1), p. 663. McArdle, S., McGale, N. and Gaffney, P. (2012). A qualitative exploration of men's experiences of an integrated exercise/CBT mental health promotion programme. International Journal of Men's Health, 11(3), pp. 240–257. doi:10.3149/jmh.1103.240 . McGale, N., McArdle, S. and Gaffney, P. (2011). Exploring the effectiveness of an integrated exercise/CBT intervention for young men's mental health. British Journal of Health Psychology, 16(3), pp. 457–471. doi:10.1348/135910710X522734 . The effectiveness of a combined exercise and internet delivered CBT intervention for young men’s mental health. British Psychological Society Division of Health Psychology Annual Conference, London, UK. (2015). Description: McGale, N., McArdle, S., & Gaffney, P.
Quality of Life and functional status following cardiac surgery. Society for Cardiothoracic Surgery in Great Britain and Ireland, Manchester, UK. (2015). ). A self-management programme and personalised genetic risk information to reduce coronary heart disease risk in primary care patients with type 2 diabetes. Primary Care Research Network, East of England, UK (2012). Description: McGale, N., Davies, A., Hirani, S., & Newman, S. P.
“Back of the Net”: The effectiveness of combined exercise and CBT interventions on young men’s mental health. Cavan and Monaghan Child and Adolescent Psychiatry 10th Anniversary, Monaghan, Ireland (2012). Developing an integrated exercise/ CBT interventions for young men’s mental health: Steps in the process and process evaluations. 13th European Congress of Sport Psychology: Human Performance, well-being and health, Madeira Islands, Portugal. (2011). Description: McArdle, S., McGale, N., & Gaffney, P.
Football, Life & Death: Can the beautiful game help us when addressing mental health issues in young people? ? Northern Ireland Branch British Psychological Society Annual Conference, Enniskillen, Northern Ireland. (2011). Description: Gaffney, P., McGale, N., & McArdle, S.
“Back of the Net”: The effectiveness of exercise-based interventions on indices of suicide risk. British Psychological Society Division of Clinical Psychology Annual Conference, London, UK. (2010). Resilience and mental health promotion programmes for young men. Monaghan Mental Health Association Conference, Monaghan, Ireland. (2010).